Robson loves the Rallye Monte-Carlo! Trained as an automobile engineer he caught the bug after watching his first RAC rally in 1953 and became a driver himself for various works teams, and was manager of another before moving into rally journalism and rally organization (1970 World Cup Rally). Moreover he has a Monte under his belt, as co-driver in 1962 of a fourth-place finisher! 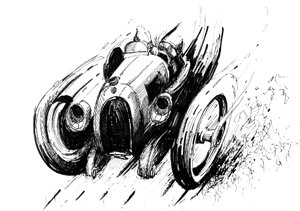 If you are a reader “of a certain age” you will recall the days when even the newspapers included daily rally updates, such was the extent to which the Monte—considered one of the toughest endurance events in the world—captured the public’s imagination! It is the oldest rally and the only one to have been run continually since its beginning in 1911 (except for 14 years of downtime due to war and government interference). The Monte is run to this day but Robson ends his coverage in 1980, the year he considers its zenith. After that time rule changes, the ascendancy and quickly dominance of all-wheel drive (Long Live the Audi Quattro! Death to the Audi Quattro!) caused him to lose interest. Today’s highly specialized purpose-built rally cars that are no longer street-legal are a far cry from, say, the 1932 entry of an anemic 65 bhp Hillman Wizard 75 with a crew of four pulling a caravan (finished 35th!) or a lumbering Citroën bus in 1934! 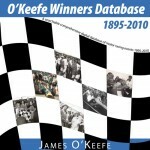 The book covers each year separately, showing route maps, top 10 results and various stats. Explanations of regulations, classes of entries, tests after arrival in Monaco, special stages, and the concours are woven into the text where they are relevant. Robson points out what changed year to year, what worked and what didn’t, always relates the human element (such as the story of Morna Vaughan, a trained surgeon who stopped to help an accident victim thereby loosing 90 minutes of which she clawed back 70 only to have the stewards penalize her—and then won the Ladies’ Cup anyway), and all around tells an engaging story. If you know nothing about the Monte this book will make you wish you hadn’t missed so much—if you already know “everything” you get to relive the excitement once more. All the photos, except the ones on the cover are b/w, which, if nothing else, creates a sense of visual continuity through the ages. They are sufficiently large, well reproduced, have detailed captions, and show a great variety of cars, people, road and weather conditions, toil and triumph. A final section addresses homologation and there is an extensive bibliography but no index. The bibliography includes a good number of Robson’s own books but, curiously, lists only one of his dozen-plus new titles in Veloce Ltd’s Rally Giants series of books. 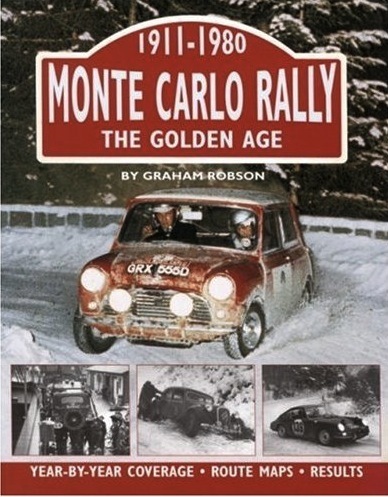 Also not listed is his 1988 title on the same subject, now out of print, The Rally Monte Carlo: The World’s Greatest Motor Competitions (Batsford Ltd, ISBN-13: 978-0713459241). Rally co-pilots need to be good at math, so let’s do some of our own: if the book covers 56 events and we have about 240 pages, each year gets how many pages? Too few! So, think of this book as a good introduction, an overview of the key highlights. 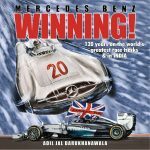 The Monte’s centenary is in 2011 and one can expect a flood of books!